You may remember from a previous post about Tyra’s newest competition “Fiercely Real Model Search” and she’s found a winner. The curvacious Sheridan Watson from New Jersey won the competition under millions of applicants. The brown skin diva landed her first photoshoot spread with Seventeen magazine and is loving the modeling life already! Not only is she representing for the curvy teen models but she is show all young girls that confidence in yourself is key to success! Tyra Launches “The Real Size” Contest. . .
“I’ve always felt it was my mission to expand the narrow perceptions of beauty; through ‘America’s Next Top Model,” says Tyra Banks about launching a Teen Plus Size Model Search. This time around, Tyra is looking for more curvier and fabulous teens ages 13-19 to enter to win the “Fiercely Real Model Search”. To enter, you must be between the sizes 12-20, and the winner will win a one-year contract with Millinieum modeling, a photo spread and cover photo on Tyra’s online magazine, and a spread on a popular fashion magazine. I applaud Trya Banks effort to include all types of women, different shapes and sizes. Young teens undergo alot of insecurities involving their personal appearance and this a chance for girls who may not be able to fit into “Forever 21” or “Limited Too” a chance to exploit their beauty. I’m excited to see what gorgeous girls come forth and embark on this contest. With society today, the normal sizes are now between 12-16, do you feel that women should no longer be called “Plus Sized” but instead “Real Sized”? Tyra is currently doing a poll and I want to know what you think also. If you would like to enter to win go to http://tyrashow.warnerbros.com/fun/teenmodelsearch/registration.php and submit for photos to get you started! Goodluck and spread the word! The episode of this seasons “America’s Next top Model” was a very different and contraversial one for many. To continute the long Makeup practice taboo Tyra did a photoshoot with the models and dressed them up to portray bi-racial women. The goal was to create an editorial celebration of the “Hapa” (that’s Hawaiian for mixed-race) children of immigrants who relocated to Hawaii to work as sugar cane farmers in the mid-19th century. Did you know that Brack Obama was considered a Famous Hapa? The models (one being black and one asian left) — Jennifer An, Nicole Fox, Laura Kirkpatrick, Sundai Love, Brittany Markert and Erin Wagner -portrayed different ethnicities like a “Russian”, “Morrocan”,”Botswanan-Polynesian” and a “Native American East Indian”. The models were then dressed in stereotypical clothing and placed in scenes close to the ethnicity that they were portraying. Then the models were sent to makeup and were painted from head to toe with darker colored brown makeup to accentuate “color” to their skin. According to AOL.com, This is the second time models have been shown in dark makeup in recent weeks. 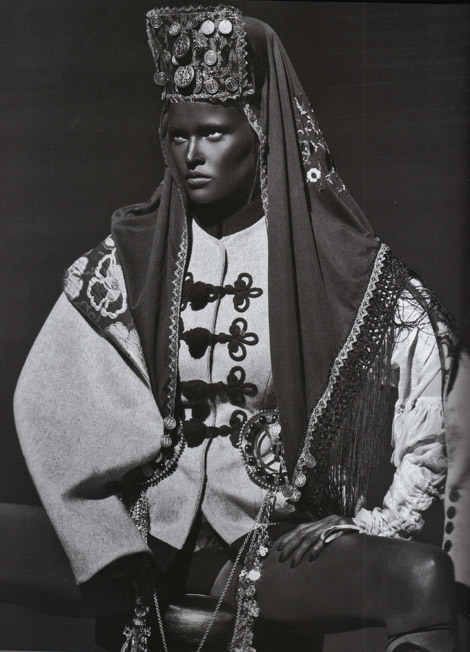 French Vogue photographed model Lara Stone in blackface for its October issue, which was particularly disturbing because the offending pictures were part of an issue celebrating models, but had hardly a black model in the magazine. So there you have it, must the fashion industry continue to portray artistic diversity without using real ethnic models? You be the Judge.